Judy Reynolds and Vancouver K. Photos copyright Sportfot. September 24, 2016 – New York, NY – Saturday night at the 2016 Rolex Central Park Horse Show (RCPHS) featured a fantastic display of world-class dressage with a win for Ireland’s Judy Reynolds and Vancouver K in the $75,000 U.S. Open FEI Dressage Freestyle CDI 4*, presented by Axel Johnson, as well as a special freestyle demonstration from three-time Olympic gold medalists Charlotte Dujardin (GBR) and Valegro. Seven entries performed their grand prix freestyles set to music in the impressive atmosphere under the lights of Wollman Rink in New York City on Saturday evening for the $75,000 U.S. Open FEI Dressage Freestyle CDI 4*, presented by Axel Johnson. It was a packed house to watch the beauty and grace of dressage at its very finest in an incredibly unique setting. With a high score of 77.051%, the win went to Ireland’s Judy Reynolds and Vancouver K, who were also the winners of the U.S. Open Dressage Grand Prix CDI 4*, presented by Axel Johnson, on Friday. Tinne Vilhelmson-Silfven (SWE) and Lovsta Stuteri’s Paridon Magi took the second place finish for the second day in a row, as well as the second year in a row, earning a score of 76.650% for their Saturday night freestyle performance. Third place honors were awarded to Denmark’s Mikala Gundersen aboard Janne Rumbough’s My Lady with a score of 72.400%. Freestyle winners Vancouver K and Judy Reynolds represented Ireland in this summer’s Olympic Games in Rio de Janeiro, Brazil, and then had a short break before making the journey to New York City for the opportunity to compete at this one-of-a-kind event. The 14-year-old Dutch Warmblood gelding sired by Jazz, and owned by the rider’s parents Joe and Kathleen Reynolds, performed consistently to win back-to-back classes this week. Reynolds got her start riding in Ireland and moved to Germany after college to continue training at a higher level. To prepare for Saturday night’s freestyle, Reynolds actually watched video of her performance at the Olympic Games with Vancouver K.
The pair’s next stop is the Dressage at Devon CDI-W in Pennsylvania since they are already in the U.S.
Tinne Vilhelmson-Silfven had a great night with Paridon Magi and also spoke of her freestyle performance on Saturday. Third place finisher Mikala Gundersen had a fun first experience competing in Central Park with her mount My Lady this week and was happy with her result on Saturday night as well. Following freestyle competition, three-time Olympic champions Charlotte Dujardin and Valegro did a momentous freestyle exhibition to the thrill of fans. 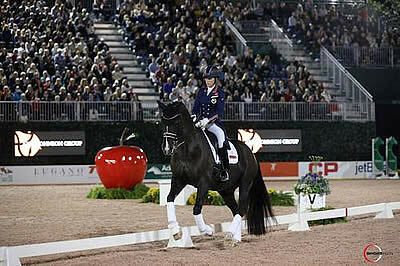 Dujardin then let spectators come down to the arena to meet her world-famous mount in person. It was a once-in-a-lifetime experience for many dressage enthusiasts and a memorable and incomparable moment at the RCPHS. Valegro will have his official retirement from a record-breaking career in a ceremony at the Olympia Horse Show in London, England, in December, and finished out his competition career on a high note at the Olympic Games in Rio. After a fantastic experience for both horse and rider in New York City, Dujardin and Valegro will now return home to England. The Rolex Central Park Horse Show thanks them and all of the horses and riders that helped make this year’s dressage edition so special. While dressage took center stage on Saturday evening at the Rolex Central Park Horse Show, hunter competition was the highlight throughout the day, featuring classes for pony, junior/amateur, and professional hunter riders in Wollman Rink. Jumping courses set by Kentucky-based designer Bobby Murphy, the three classes featured beautiful, hand painted fences and specially added decor for the unique afternoon of competition. The $50,000 Duchossois Cup, presented by The Gochman Family, was the highlight event of the day session with a win for top hunter rider Kelley Farmer aboard Nine Moore’s Kodachrome. Fifteen entries jumped in round one, and the top ten then returned for a second hunter round to determine overall scores. For Farmer and the eight-year-old Warmblood gelding Kodachrome, the judges awarded 88 points in each round for the winning 176-point total. Liza Boyd and Stella Styslinger’s O’Ryan finished second with scores of 87 and 88 for a total of 175. John Bragg guided Ann Thornton’s Early August to third place honors with a score of 173, earning 86 and 87 in their respective rounds. Representing class sponsor The Gochman Family, Becky Gochman spoke about the second annual U.S. Open Hunter competition in Central Park and the great classes on Saturday. Farmer also competed in Central Park in the inaugural year of hunter competition in 2015 and was proud to come back and get the win this year. She was aboard a great horse that has earned many top results throughout the season. “I want to say thank you to Becky and David Gochman and all the other sponsors that put this on,” Farmer remarked. “This is amazing to be in the middle of Central Park in this venue. It is pretty unbelievable. What a beautiful class. Owner Nina Moore also remarked on the event and watching her horse win in one of the world’s most famous venues. “As an owner, a lot of times you go with a trainer and have to have a little bit of faith,” Moore noted. “This particular horse has done everything I was told he could do. I know the trainers always want them to be that, but how many times does lightning strike? He has just been everything. Second place finisher Liza Boyd spoke about her mount O’Ryan and her experience competing in Central Park as well. Boyd also praised the addition of young announcer Caroline Passarelli this year. “I think that the addition of Caroline was amazing, that was really spectacular,” Boyd stated. “Thank you to the Gochman Family, and everybody involved. Bruce Duchossois was a part of this too, and we love him and miss him, and I think he would have loved it. Bragg was aboard a young horse in eight-year-old Early August, a Belgian Warmblood gelding that he imported just over one year ago. While the competition welcomed young riders on ponies in the arena, young equestrian Caroline Passarelli also enjoyed the opportunity to commentate on the fantastic classes and hopes to do more in the commentating business and horse industry in the future. The $2,500 Junior/Amateur-Owner Hunter Classic was held earlier in the afternoon on Saturday at the RCPHS and saw a win for Mindy Coretz, of Tulsa, OK, riding Eighteen Acres Farm’s Happy Hour to a high score of 80. Teddy Vlock and Century Performance Horses’ At Last placed second with a score of 78. Stella Styslinger guided her own O’Ryan to a third place finish with a 77-point total. Coretz trains at home with Libby Barrow at Farewell Farms and had the help of hunter trainer Hope Glynn in New York on Saturday. She is currently in her final semester of college at the University of Tulsa, studying Business Management. Coretz had just finished showing for the summer and decided she could not make it to this year’s fall indoor competitions because it would cause her to miss too much school, but when a couple of other opportunities came up, including a chance to compete the RCPHS, they were too great to pass up. Winning horse Happy Hour is a nine-year-old Dutch Warmblood gelding (by Argentinus) that Coretz purchased last summer. Though Coretz has three exams and a paper due on Monday and will head straight home to study, the memory of winning a class in Central Park is something the rider will remember forever. The $1,000 Pony Hunter Classic also gave some younger riders the experience of competing in Wollman Rink in front of the New York City skyline and saw a win for 12-year-old Zola Thompson of Birmingham, AL. Zola trains with Jack Towell and Liza Boyd at Finally Farm and guided Robin Greenwood’s Elegance to victory with the high score of 85. Baylee McKeever rode Lee McKeever’s Greystone’s Star Bright to second place with a score of 75. Lucy Thornhill and her own Sneaky Fox placed third with a score of 74. Thompson has ridden Elegance (aka Ellie) for almost one year and was very happy with the mare on Saturday. “She has been really great. She is really calm and smooth,” Thompson described. “She is a really fun pony to ride and she has a really great jump, so I am thankful to be riding her. The 2016 Rolex Central Park Horse Show (RCPHS) concludes on Sunday, September 25, with Family Day at Wollman Rink and Free General Admission. The day’s activities include pony rides, face painting, a Show Hunter presentation, and more! Gates are open 12:00-3:00 p.m. The $216,000 FEI Grand Prix CSI 3*, presented by Rolex, and Friday night ceremonies will be broadcast on NBC Sports Network on Sunday, September 25, from 9-10:30 p.m. EST. For more information and full results, visit www.centralparkhorseshow.com.